If you were probably watching this morning’s Senate hearing on the Equifax hack, you may have seen something out of the corner of your eye and asked, “Did I just see Rich Uncle Pennybags from Monopoly sitting behind the Equifax CEO?” Yes, yes you did. The real-world incarnation of Uncle Pennybags (you can just call him Mr. 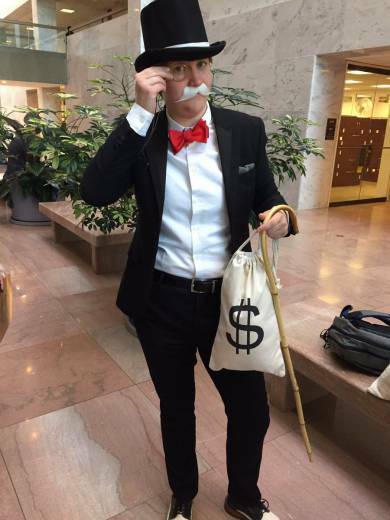 Monopoly) — complete with morning suit, fancy white mustache, monocle (non-canon*), cane, bowtie, and a sack marked “$” — made an appearance today on Capitol Hill, as a member of the gallery in a hearing before the Senate Banking Committee. Former Equifax CEO Richard Smith was delivering testimony about the massive Equifax breach to the Senate for the second time in as many days at the hearing. However, the true star of the proceeding was the photobombing viewer seated just in camera range behind him. No, this wasn’t some sort of guerrilla marketing by Hasbro. In fact, this Uncle Pennybags was a woman, Amanda Werner, who manages Public Citizen’s campaign against the use of forced arbitration — the practice of stripping customers of their right to sue the companies they do business with. Public Citizen says that Werner also delivered the “get out of jail free” cards to this week’s Wells Fargo hearing as well as all 100 Senators’ offices.